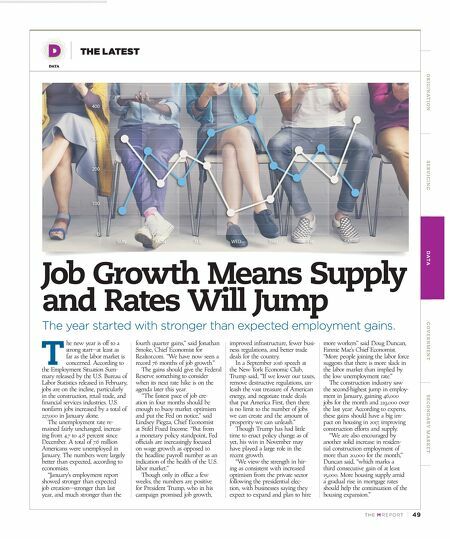 TH E M R EP O RT | 49 O R I G I NAT I O N S E R V I C I N G DATA G O V E R N M E N T S E C O N DA R Y M A R K E T DATA THE LATEST Job Growth Means Supply and Rates Will Jump The year started with stronger than expected employment gains. T he new year is off to a strong start—at least as far as the labor market is concerned. According to the Employment Situation Sum - mary released by the U.S. Bureau of Labor Statistics released in February, jobs are on the incline, particularly in the construction, retail trade, and financial services industries. U.S. nonfarm jobs increased by a total of 227,000 in January alone. The unemployment rate re - mained fairly unchanged, increas- ing from 4.7 to 4.8 percent since December. A total of 7.6 million Americans were unemployed in January. The numbers were largely better than expected, according to economists. "January's employment report showed stronger than expected job creation—stronger than last year, and much stronger than the fourth quarter gains," said Jonathan Smoke, Chief Economist for Realtor.com. "We have now seen a record 76 months of job growth." The gains should give the Federal Reserve something to consider when its next rate hike is on the agenda later this year. "The fastest pace of job cre - ation in four months should be enough to buoy market optimism and put the Fed on notice," said Lindsey Piegza, Chief Economist at Stifel Fixed Income. "But from a monetary policy standpoint, Fed officials are increasingly focused on wage growth as opposed to the headline payroll number as an indication of the health of the U.S. labor market." Though only in office a few weeks, the numbers are positive for President Trump, who in his campaign promised job growth, improved infrastructure, fewer busi - ness regulations, and better trade deals for the country. In a September 2016 speech at the New York Economic Club, Trump said, "If we lower our taxes, remove destructive regulations, un - leash the vast treasure of American energy, and negotiate trade deals that put America First, then there is no limit to the number of jobs we can create and the amount of prosperity we can unleash." Though Trump has had little time to enact policy change as of yet, his win in November may have played a large role in the recent growth. "We view the strength in hir - ing as consistent with increased optimism from the private sector following the presidential elec- tion, with businesses saying they expect to expand and plan to hire more workers" said Doug Duncan, Fannie Mae's Chief Economist. "More people joining the labor force suggests that there is more slack in the labor market than implied by the low unemployment rate." The construction industry saw the second-highest jump in employ - ment in January, gaining 46,000 jobs for the month and 229,000 over the last year. According to experts, these gains should have a big im - pact on housing in 2017, improving construction efforts and supply. "We are also encouraged by another solid increase in residen - tial construction employment of more than 20,000 for the month," Duncan said, "which marks a third consecutive gain of at least 15,000. 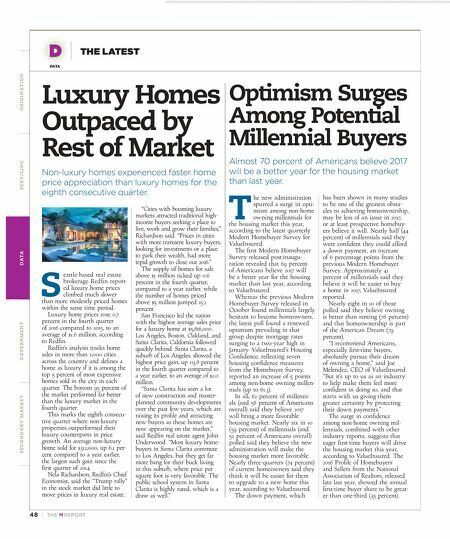 More housing supply amid a gradual rise in mortgage rates should help the continuation of the housing expansion."